In the seventies, Daniel Spoerri and Marie-Louise Plessen travelled through Brittany, visiting over 200 springs which were said to have a healing effect or being oracles for specific questions. 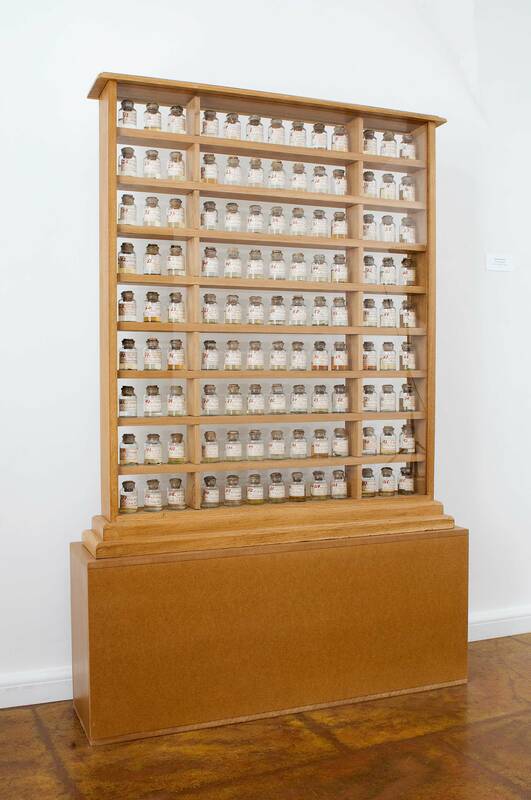 Together, they mapped the springs and documented the oral information on location about the springs, their history and their attributed effects; moreover, Spoerri collected and bottled water-samples of 117 springs, thus forming his oeuvre “Pharmacie Bretonne”, the Breton medicine-chest. The recorded information and documentary photographs of the springs formed the contents of the publication “Heilrituale an bretonischen Quellen”, published by Paul Gredinger 1977. The 3000 signed copies of the art-book by Spoerri and Plessen were only available by swapping another book of random choice. Below: Documentary Photograph of the “Pharmacie Bretonne” by Rita Newman 2009.